National Geographic best described on the cover of their special edition why we have CONSTANTLY beautiful clean, clear water in Lake Jocassee & Lake Keowee. Bottom Line: our waters flow through, “Pristine Locations & Unspoiled Environments.” We have three beautiful lakes in our area. 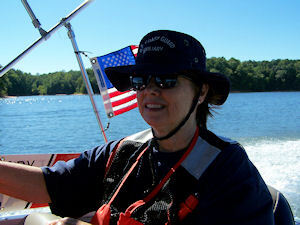 Many of these are personal photos from our outings on Lake Keowee, Lake Jocassee and Lake Hartwell. 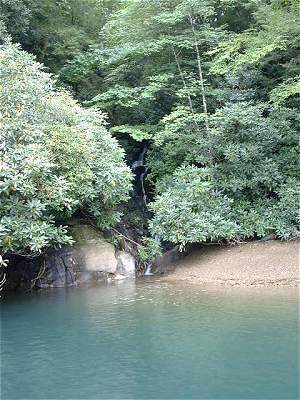 Many streams and major rivers from the Blue Ridge Mountains in North Carolina fill these lakes with clear, cool mountain water. This is a chain of lakes running north to south. Just northwest of Lake Jocassee is Bad Creek Reservoir. 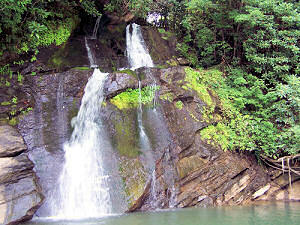 During times of peak electrical demand, Bad Creek's hydro-electric turbines provide extra power. At night, the water is pumped back up to Bad Creek. 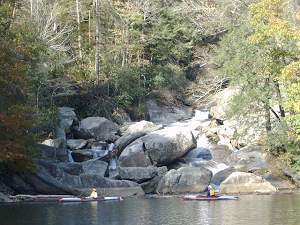 The Whitewater River, one of the many rivers that fills Lake Jocassee, boasts the tallest waterfall east of the Mississippi — Whitewater Falls — which is just a short drive from Lake Keowee. 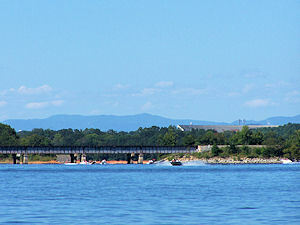 The Keowee River carries these mountain waters past the Clemson football stadium to fill the 56,000 acre Lake Hartwell. After that, the waters flow through	several more lakes down the Savannah River on their way to Savannah, Georgia. 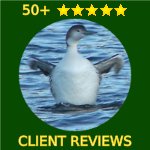 Visit our Lakefront Communities gallery and client reviews. This is an amazing creation that borders the Eastern Continental Divide. 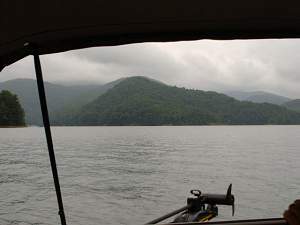 The north side of Lake Jocassee is in Transylvania County, NC which is one of the wettest areas in the US; it gets an average of 90 inches of rain per year (Seneca only gets 53)!! 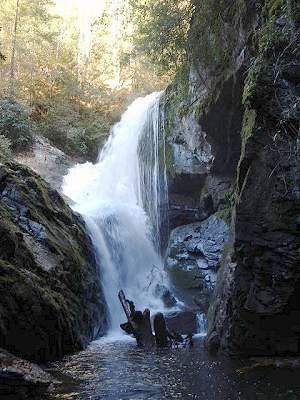 It is the home to Gorges State Park. The moisture of the Gulf of Mexico makes it way to the mountains. 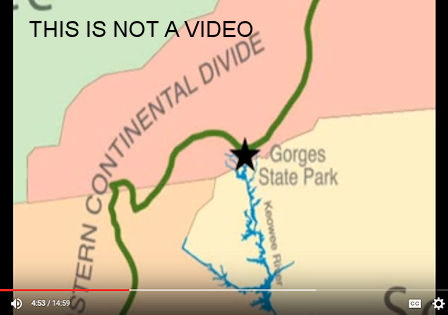 It hits the Blue Ridge escarpment at the Gorges like a back stop - like a wall that just stops the moisture. This huge influx of water from this concentrated area is one reason why Jocassee and Keowee constantly have such pristine, clear, emerald water. Watch these amazing videos below (left) to experience and understand this natural wonder. 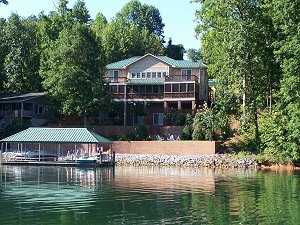 Jocassee Gorges is a great and nearby place to visit but we love living in the beautiful Lake Keowee area so we don't have to battle the ice and snow! 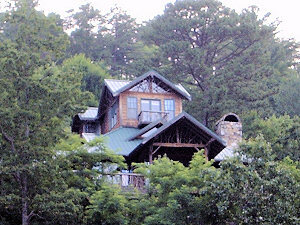 Jocassee is a beautiful lake just north of Keowee which is surrounded mostly by protected forest land and only a few homes. 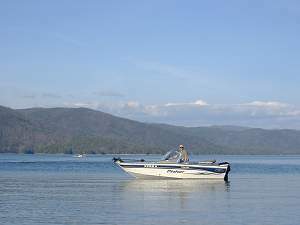 Lake Jocassee has what many consider to be the most spectacular views of any lake in the area. 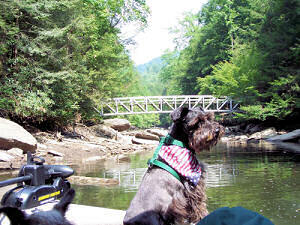 The Whitewater, Toxaway, and Horsepasture Rivers all empty into Jocassee. 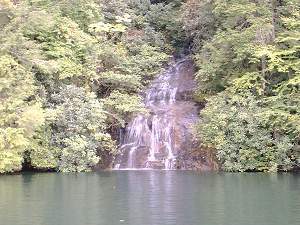 There are several impressive waterfalls - 27 in total. 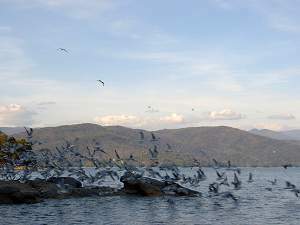 Most of the lake's 75 miles of shoreline is surrounded by protected forest areas, a state park, and only two small, secluded residential communities. 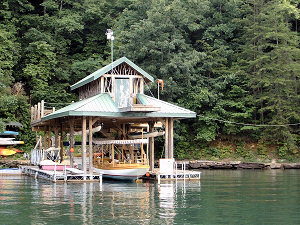 In our humble opinion this is the ultimate lakefront experience in the South Carolina Appalachian mountains. 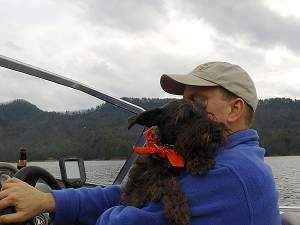 Lake Jocassee is very private and unspoiled. 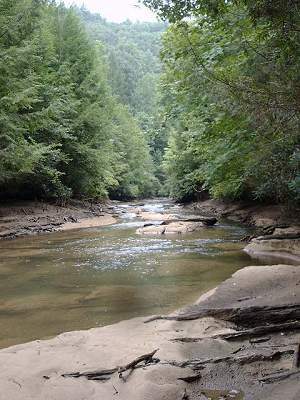 Created by Duke Power for power generation, Jocassee is over 7,500 acres of clear, cool water from protected Appalachian streams and rivers. 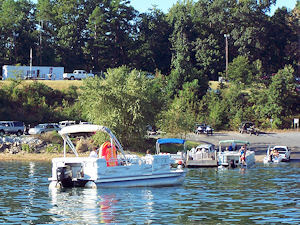 It is a paradise for swimmers, divers, boaters, and fisherman. Full pool is 1,100 feet above sea level with depths up to 350 feet. 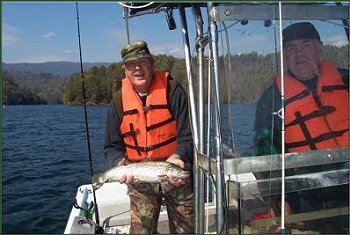 Read more about Lake Jocassee history, check current lake levels, and see a Jocassee map including trail access points. …this! Keep your boathook handy. Kayakers getting up close to the falls. 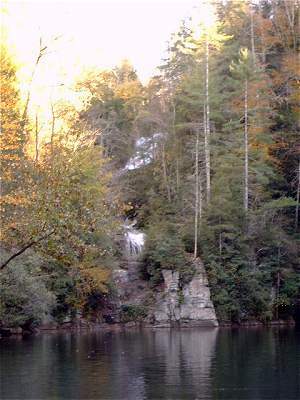 Another of many waterfalls on Jocassee. A “smoky” day in the mountains. The last falls on the Whitewater River. Gretchen getting her sea legs. 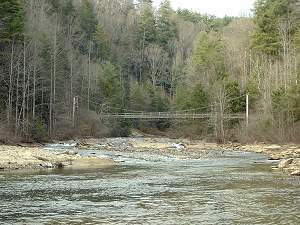 Footbridge over the Toxaway River. 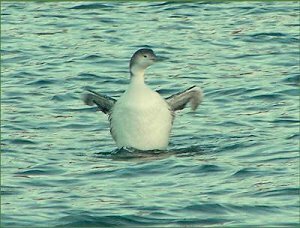 The loons from Maine spend the winter here. Hiking bridge over the Horsepasture River in NC. 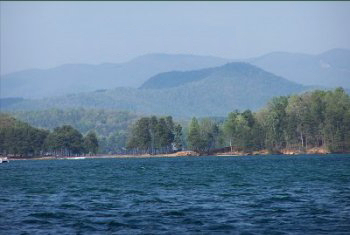 Lake Keowee is partially in the mountains, with the southern end in the foothills (Google Map). Some waterfront lots are available with mountain views, with many other waterfront lots available. 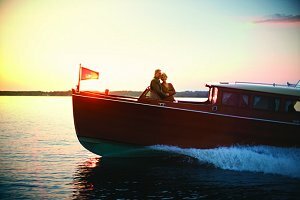 There is plenty of open, deep water for boating. 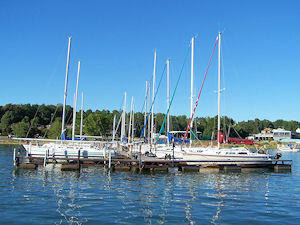 At the south end of the lake is the Seneca Marina. 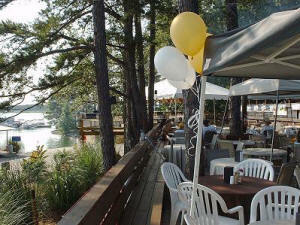 Pull your boat into the star-shaped dock, refuel, and enjoy lunch at the outdoor restaurant overlooking the lake. 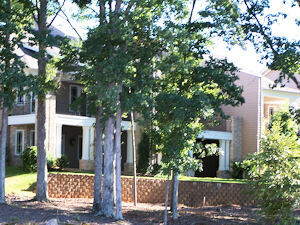 Visit our Lakefront Communities gallery. 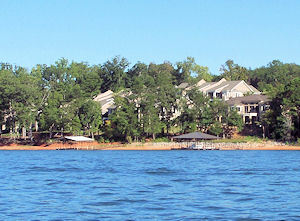 At a full pool elevation of 800 feet, Lake Keowee is 29 miles long, has 18,500 acres of water and 300 miles or shoreline. Depths average 54 feet and go as deep as 297 feet. This lake supplies water for the cities of Greenville and Seneca. 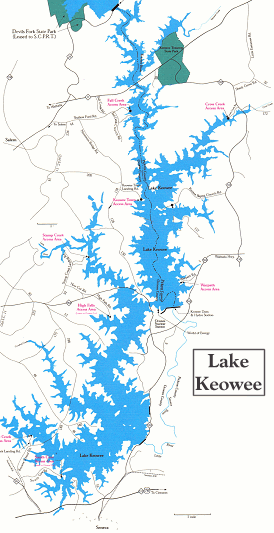 Even in times of drought, Keowee residents are blessed with great water levels (except for annual spillway service). 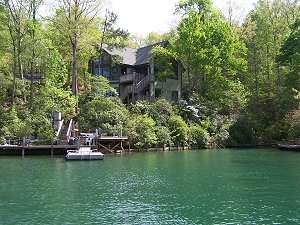 Lake Keowee is not highly sensitive to drought; Duke Power created the lake for power generation, so the water levels remain deep. 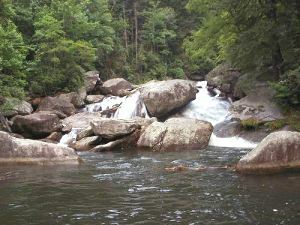 Lake Jocassee (to the north) and the Bad Creek reservoir (north of Jocassee) supply water for this purpose. 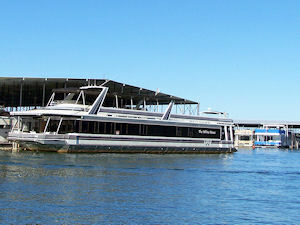 There are several parks and boat access areas. 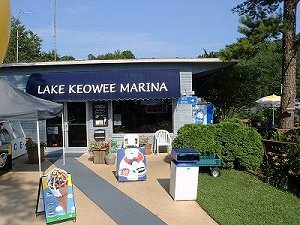 There has been a lot of misunderstanding about Duke's latest relicensing for managing Keowee and Jocassee. There were rumors that Duke wanted to, “lower the lake 10 feet.” This is not true. Please see this document from Duke Energy called, “Focus on Keowee Lake Levels.” This plan deals with conditions of extreme drought while protecting the electric supply during those times. 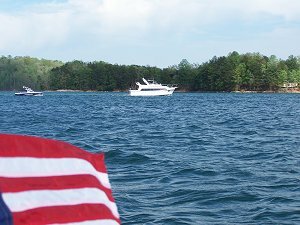 The operating range for Keowee in normal conditions under the new plan would actually be higher than is allowed now. 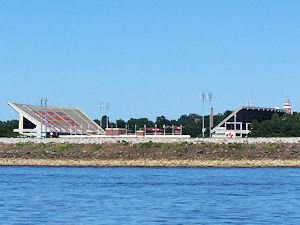 The Shoreline Managament Guidelines and Shoreline Management Plan have also changed. In addition, there are minimal vegetative buffer requirements in Oconee County and Pickens County on Lake Keowee. 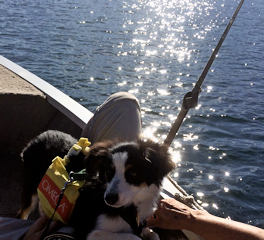 The Patterson family & Aussie puppy Sadie Rose, enjoy the Keowee Key Boating Association Beach-Ups! Click for video. Sadie Rose loves the lakes. 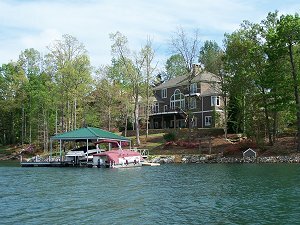 Learn about all the lakes the Robertsons researched before they bought their waterfront home in Keowee Key. Lake Martin, AL. Pretty lake but lowers more than 10' in the winter. 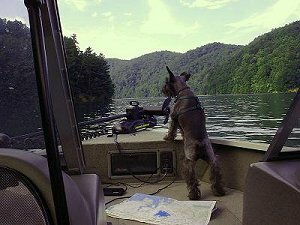 Year round water is expensive and many hazards if you wanted to boat during the off season. Lewis Smith Lake, AL. Pretty lake, reasonable home prices, but somewhat rural feeling to it. Nearest big town is Birmingham which is not the greatest but good medical. Lake Jackson, GA. River lake, nasty water. Good proximity to Atlanta though. 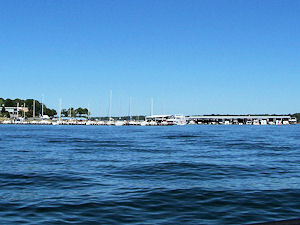 Lake Lanier, GA. Pretty lake, water levels can fluctuate, though. Proximity to Atlanta can make it very crowded on weekends. Seemed like practically a suburb of Atlanta. Army Corps of Engineers lake so they pretty much control what you can or cannot do with the shoreline up to the Corps line. Lake Hartwell, GA/SC. Big lake just south of Keowee. Water can fluctuate quite a bit (it was 15' down when we visited, but full now). Housing prices much more reasonable than Keowee. Water not near as pretty as Keowee. Intimidating size and Army Corps lake again which affects what you can do regarding shoreline. Lake Greenwood, SC. 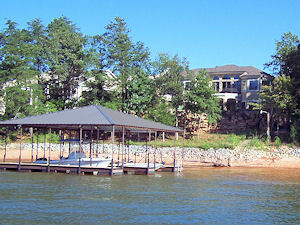 Nice lake, communities, and reasonable home prices. Water not very nice. Rural area. Lake Keowee, SC. 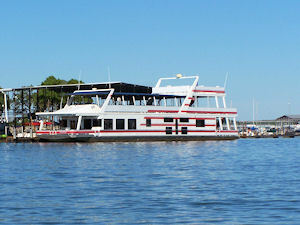 Beautiful lake, convenient to Greenville, Charlotte, Atlanta, and the coast. Good lake water levels and year round boating. 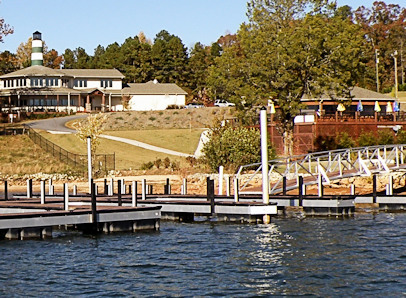 Many Keowee homes have covered docks. A 4 bedroom home with a concrete dock. Just south of Lake Keowee is Lake Hartwell. 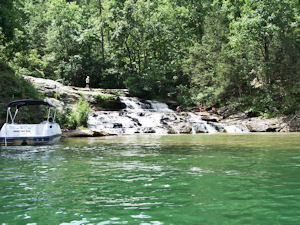 Completed is 1963 for hydropower generation, Hartwell is one of the largest public recreation lakes in the southeast. 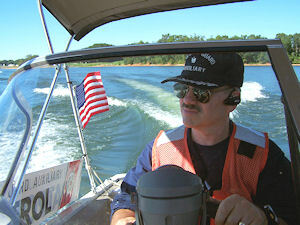 Hartwell is one of many lakes in South Carolina and Georgia managed by the U. S. Army Corps of Engineers. 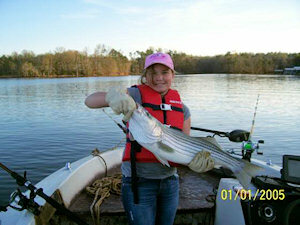 At 56,000 acres with a maximum depth of 176 feet and a mean depth of 45 feet (water levels), Hartwell is well known for bass fishing and recreational boating. 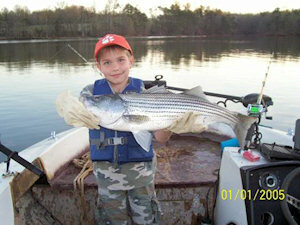 It extends 49 miles up the Tugaloo River and 45 miles up the Seneca River and has 962 miles of shoreline. 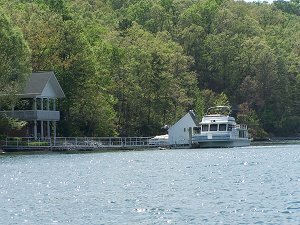 If you are interested in a lakefront home on Hartwell, be sure that your dock is in a deep enough cove that it will remain in water when the levels drop. My fish is bigger than my sister's!